1. Have you ever tried to paper piece a quilt block before? Many times. 2. If not, why? If yes, what did you make? I think the first one I ever made was a bird for a block exchange. (I think I have a picture somewhere but I can't find it!) 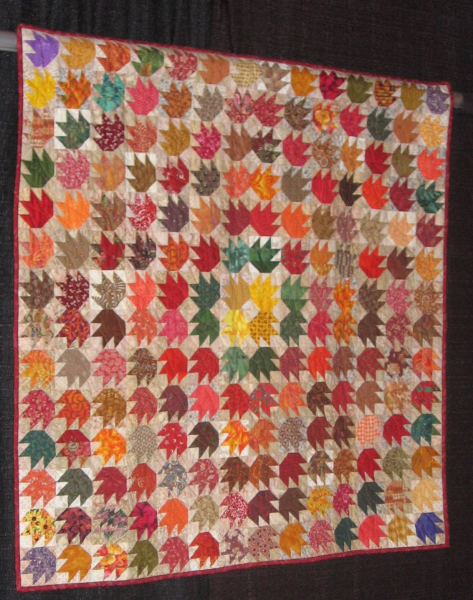 And in an extended fit of insanity, I paper-pieced 200 autumn leaf blocks. (see below) But I also paper-piece "normal" things like log cabins and flying geese sometimes. It's a little more time-consuming but it's really good if you're having trouble getting something to come out perfectly accurate. 3. Is there a paper piecing pattern you are dying to test out (post a picture or a link)? Not that I can think of. 4. Have you ever designed your own paper piecing patterns? I've drafted my own a few times - I wouldn't really say designed. I only would do it for very simple things like maybe flying geese or something like that. 5. Would you be willing to learn or teach someone about paper piecing? I could show somebody, sure. 1. How many quilt shops are within 2 hours of your home? A lot. Well over a dozen, since the entire Houston metropolitan area is within that distance. 2. Have you been to them all? No. I've been to all the ones that were on the old Houston-area shop hop, but I know there are some more that never got included. Now they have another shop hop, and I've only been to one on that list. 3. Have you visited other shops while on traveling in different states? Some, but not as much as I would like to. 4. What is your favorite quilt shop? Gosh, I don't know. They're all different. Plus it also varies by how well their buyer's taste is lining up with mine in any particular season. But the Quilt Store in Austin has always been a favorite. And Painted Pony and Sew Contempo, both on the south side of Houston. 5. Do you plan your trips around visiting quilt shops? No, but I should. I worry about dragging my husband too far out of the way and him being bored and so forth, but he drags me 1000 miles away once a year to see his parents, so it's really not too much to ask! It's my fault, I need to be more assertive about it. 1. Have you ever participated in a quilt block swap - online or with a guild? Yes, several. 2. Would you be interested in doing one? Not right now, no - maybe sometime in the future! 3. What reservations would you have to not participating in a swap? My problem with swaps is that I still have the blocks from the last couple of ones I did sitting around unfinished. I have sworn not to do any more until I put those together! 4. Ever hosted a swap before? Nope. 5. Where do you find online swaps? I've never actually done a block swap online - all mine have been through the quilt guild. 1. Do you notice yourself choosing light, medium, or darker tones the most? Medium to dark, I guess. I love jewel tones. 2. Which specific color group do you tend to gravitate towards? Blues and greens. 3. What colors/themes/genres fabrics do you consider "outside your comfort zone"? Nothing, really. I don't normally buy solids but that's because I don't like the feel of them - and they ravel too much - not because I don't like the colors. 4. Do you notice, over time, your color choices change? Oh heck yeah. I used to be much more conservative and - somebody wrote about this lately, was that here? - only buy the colors that I usually buy for clothes - which means no earth tones to speak of. Gradually I've expanded my taste, though. 5. Do you ever purchase fabric out side your comfort zone? See above. I learned to, yeah.